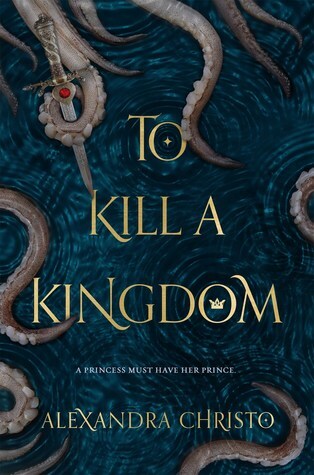 To Kill A Kingdom is a loose retelling of The Little Mermaid, following Lira, the daughter of the Sea Queen, and Elian, prince of Midas, pirate, and ruthless siren killer. Lira has developed a name for herself as heir to the throne and siren princess, the Prince’s Bane, for every year she kills one prince and steals his heart. Elian has made it his life’s goal to end the Prince’s Bane and sirens altogether. When Lira is cursed by her mother, she is made human and told to bring back the heart of the siren killer, but first, she must win over his trust. This book takes place in a fantasy world filled with various kingdoms, each with their own myths and legends. All the lands that the characters go to are extremely well described, and you can just tell that they hold a rich history, even if there isn’t much time to delve into them. No place they travel to feels underwhelming, each location is just as fascinating as the last, but for entirely different reasons. The mythology was also really well written, and easily understandable while not being simple or cliche. Also, there are a lot of fascinating magical objects that I just really wish I could have in real life (like Elian’s compass, or even Elian’s knife)(don’t ask me what I would use the knife for). The writing style was probably my favorite part of this book. Alexandra Christo writes so beautifully, her descriptions vivid and dialogue entertaining yet true. I can’t wait to see what else she does because she hooked me with this book. She managed to make the simplest lines feel poetic and beautiful. It was mesmerizing. The characters in this book were also amazing. I love morally gray characters, and this book has a lot of them. While they do develop, there is no urge for them to be perfect people, because they aren’t and they don’t care to be. Lira and Elian were great protagonists, their secrets adding to the suspense, and their overall growth subtle yet clear. Lira is such a strong character. Having dealt with abuse and manipulation, her arc was amazing to watch. Elian was also great. He’s cocky, noble, but also has a ruthless side. While he cares about his family and his kingdom, he also wants to live his own life and be free (something that usually feels cliche in fantasy right now, but with him, it felt genuine and understandable). Also, he’s so sarcastic and I live for it. The side characters were also great. The cast was very diverse, and the characters all well-written and interesting on their own. They were all likable and just so fun! The relationship between Lira and Elian was another fantastic part of this book. Most YA books have a cliche love story (which I almost always adore), but I love how their story isn’t rushed or really on the forefront of the novel at all. It’s just as subtle as their growth, and when it does happen it feels right, not in-your-face and forced. To Kill A Kingdom is a Little Mermaid retelling, but it’s so different. While there are a lot of parallels, it really is its own story. I absolutely love retellings, but I do know when they follow it by the letter, it can get boring. In this book, Alexandra Christo takes what we love from the original, and throws in her own twists and turns. It feels completely fresh and original, while also having that hint of the story we all know. So if you aren’t a fan of retellings, I would recommend picking this up anyway because of how much it makes the story it’s own. If you do like retellings, then 100% pick this book up right now why are you even reading this far into the review? Pros– The writing is absolutely stunning, witty and enchanting characters, fascinating world, great mythology, honestly everything is amazing. Cons– I am genuinely stumped, trying to think of some cons. I guess I wish we could explore this world more? But at the same time, it wrapped up so well… I don’t know. Don’t look to me for complaints about this book. To Kill A Kingdom is a fun, thrilling read with writing that will blow you out of the water.